Skiing has been around for at least eight millennia. Skis from 6000 BCE have been found in northern Russia, while 5000-year-old cave paintings in China appear to show people skiing. These early skis would have been bio-based, that is made from an organic material: wood. Modern skis, however, are a little different. Generally, they have a core that is often wood, sandwiched between layer of composite material and finished off with a topsheet and a sliding base, which can be made from a variety of materials. And snowboards are very similar. The composite layers of skis and snowboards are normally made from plastic and carbon or glass fibres. But large companies are increasingly adding flax strands to the mix. Over the last five years, flax fibres have become much more prevalent, according to Paul Sherratt of the Sports Technology Institute at Loughborough University in the U.K. This comes with a drive towards more sustainable products. In addition to being more environmentally friendly, flax is becoming more popular because it offers some technical advantages over glass and carbon fibres, Sherratt says. In particular, flax fibres produce less vibration in use. "Flax is much better at dampening, so it helps reduce vibrations and improves the feel of products, which is an incredibly complicated area within sport," Sherratt explains. Ignaas Verpoest of the Composite Materials Group at Katholieke Universiteit Leuven, in Belgium, says there is a simple reason why vibrations disappear faster: the structure of flax. A carbon or glass fibre is a solid filament, while a flax fibre is a made up of tiny elementary fibres, which dissipate energy and produce fewer vibrations. "If you have a full carbon layer on a ski and you are skiing on hard, icy snow it's disgusting, you feel everything under your foot, all the vibrations," says former professional skier Patrick Vuagnat. But he wouldn't recommend completely removing carbon as a component. "All fibres have different mechanical properties and to guarantee performance it is better to have a mix," he explains. Vuagnat now works for Bcomp, which produces flax fibre fabrics and a range of balsa wood and flax cores for skis and snowboards. He explains that "balsa is so light that you shouldn't be able to make skis with it," but by layering it with flax fibres in a plywood-like construction, they have created an extremely light core now used by more than 30 snowsport companies. Hanno Schwab builds skis using flax fibre composites, and wood and flax cores from Vuagnat's company. When Schwab founded Earlybird Skis seven years ago, he initially used carbon and glass fibres, but quickly found that he didn't like working with these materials. "I soon realised that you have a lot of waste when building skis and it is all toxic, and when you cut and grind the carbon, they irritate your skin," he explains. Schwab says that his company now produces more sustainable skis with a carbon footprint around half that of a standard ski. But there is still a small amount of carbon fibre in their composites. "We built skis with 100 percent bio-based systems and we tested them and we found that they lose their shape very fast," Schwab explains. The carbon fibre adds strength to the skis and extends their life by a few years, which makes them more sustainable by reducing waste, he says. Bio-based or not, the end-of-life of a modern ski is not environmentally friendly. Once all the layers are bound together, they are really difficult to separate to extract and recycle all the components, whatever they are made from. But there could be a solution on the horizon. 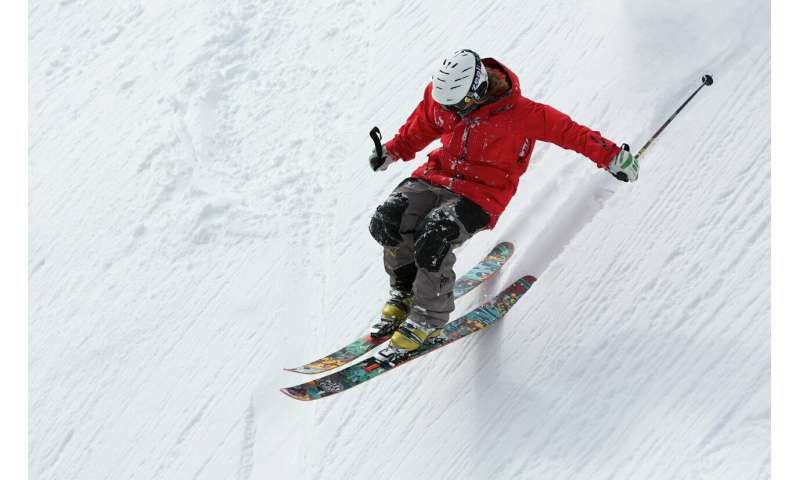 One company claims to have developed bio-based resins for composite materials that can be dissolved under certain conditions, allowing the composite – or ski or snowboard – to be pulled apart.